Anthony Cowin: Street of Crocodiles. 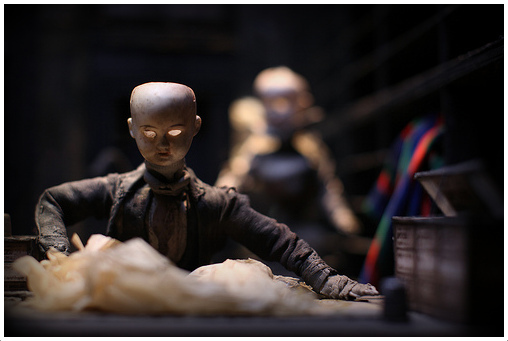 Street of Crocodiles is a puppet film that starts with a human, a caretaker of a lecture hall. His only contribution is to wind up the puppet box and lean above it dropping his saliva into the dust of the marionette world bringing it to life. He’s God, the great caretaker, his spit the life force of the discarded toys. Inside we find a Heath Robinson labyrinthine world powered by cotton reels and corroded sentient screws. The puppet master snips a spindly man from his restrictive bonds allowing him to travel through the streets in search of a Victorian doll child that guides him with mirrored light. Once he's cut from his umbilical string his journey seems pointless, being born is the only reason he’s alive. There are no ultimate goals or destinations to reach. The world is mechanical and dark. Through dusted windows the labours of the subterranean puppet world are viewed, from engineers with golf ball bulb heads trying to revive light in others, to tailors stitching together raw slabs of liver and maps to make new men. Cartographers of the body, the routes fused with the marionettes yet the course is circulatory, the destination the departure point. A line of travel that traces only borders. These architects of demarcation scurry around with empty egg cup heads. Literally these are brainless geographical engineers dividing new bodies of land with yellow lines in place of green. 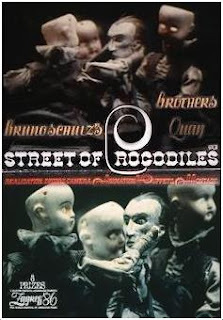 This short film doesn't have any obvious plot and at times it feels like the Quay Brothers simply wanted to construct a series of grotesque vignettes in the tradition of East European stop motion as a curiosity piece. But as a whole the feeling of despair, of being boxed in, in being reliant upon gods and masters who send us on journeys with only fractured reflections of reality to guide us feels like the world around us. The haunting sounds echoed throughout by Leszek Jankowski musical montage only heighten this sense of segregation and despair. Lessons from the toy box? Streets of Crocodiles is dusty and dirty. It’s unconnected even though every part of its world is joined together. It relies upon loose screws and hastily constructed maps of parchment stitched together to function. It could be about conflicts in the Middle East to the threat of fascism. It could be about hierarchy and class, politics and power. It may simply be about how humans exist on this boxed in planet we inhabit. I personal tend to think it’s the latter while whispering cautions about all the former possibilities. This short film could be viewed as an existentialist treatise or a siege horror. No matter how you look at it or what you take from it Street of Crocodiles will stay with you long after viewing, possibly into that workshop of horrors, your nightmares.